The Denver Nuggets went into Friday’s game on a two-game losing streak with their latest being a 135-130 loss to the Brooklyn Nets; a game in which Brooklyn knocked down 19 3-pointers and D’Angelo Russell went for 27 points to defeat Denver. Really, it wasn’t that close. The Nuggets fought back after being down by as many as 21 points with the help of Nikola Jokic’s 10th triple-double of the season. But in the end, it was the Nets who were the victors and sent the Nuggets away with a two-game losing streak. On Friday, the Nuggets had a chance to break that skid against a revamped Philadelphia 76ers team that made headlines this week with their blockbuster trade picking up Tobias Harris, Mike Scott and Boban Marjanovic. The game was played close but in the end it was the 76ers who ran away with the 117-110 win. With the Nuggets longest losing streak of the season we present you the good, the bad and the ugly. Joel Embiid has been the best big man in the entire NBA as he came into the game averaging 27.4 points and 13.5 rebounds. He looks unguardable on offense with some of the best moves and footwork in the low post as any big in the league. He is able to knock down jump shots from long range, and also provides defense, pushing himself into the conversation for the Defensive Player of the Year. Yet on Friday, the Nuggets did a stellar job on limiting the All-Star big man to only 15 points on 4-17 shooting from the field. The Nuggets did a great job at sending different looks his way and forcing him to take outside shots. Jokic and Mason Plumlee also made it a point to push him off of the block and force him to shoot on the exterior. 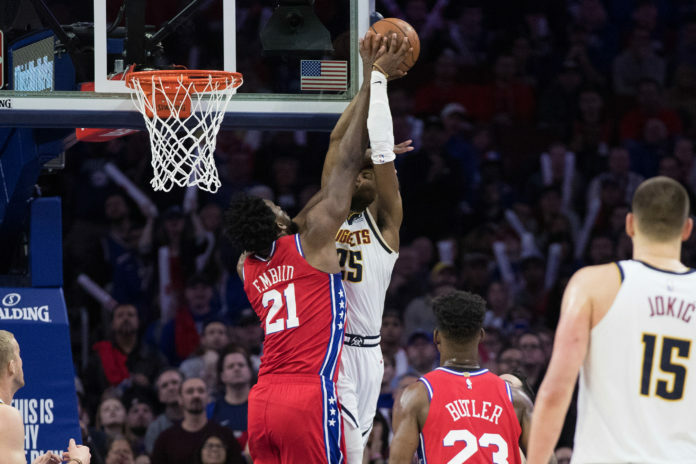 Embiid did however start to get things going in the second half of the game, as players of his caliber should, but the Nuggets corralled him for most of the night. On the defensive end, Jokic gave Embiid all that he could handle. 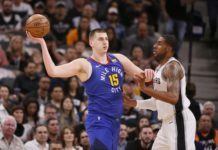 Jokic finished the game with a triple-double of 27 points, 10 assists and 10 rebounds and proved that he could have an exceptional game no matter who is on the opposing team. The Sixers new-look lineup seemed to fit right in as they started out fast on the Nuggets in the first quarter. Philadelphia went on two runs early in the game that put Denver in quite the hole before they were able to fight back in the second quarter. The early 10-0 run as well as the 7-0 run to close the quarter hurt, and the Nuggets did not have any answers back defensively. Denver started out slow for yet another game defensively, but on the offensive end they struggled as well. Denver shot only 37.5 percent from the field for the first quarter while missing open shots, forcing jumpers as well as turning the ball over. That allowed the Sixers to get out on the fast break. On defense, Denver let shooters knock down open shots, did not communicate on screens or on the fast break and could not get multiple stops in a row. Denver turned things around in the second quarter as they rallied back by winning the frame 33-23. Denver ran on the fast break, got in the paint and started attacking on the interior while buckling down on the defensive end. The Nuggets closed the half on a 22-6 run and went into the half tied, giving the team new life. If Denver could somehow find a way to start out with more energy they would go into the half with a lead and then use their strong second half play to win games. Slow starts have been the kryptonite for the Nuggets all season long and ended up hurting Denver in Friday’s game. It was not as though the Nuggets played badly — the 76ers are one of the best teams in the NBA — but with the 117-110 loss, it marks the third straight game that the Nuggets dropped. That is now their second-longest losing streak of the season. Denver started the game out flat, just as they have on the road multiple times, before having to dig themselves out of a hole and attempt to fight back. In the loss, the Nuggets outscored the 76ers by 28 points in the paint and forced their will inside all game long. Despite the dominant inside presence, the Nuggets struggled mightily from deep. Denver’s 3-point woes continued as they shot only 23 percent from the 3-point line. Not only that, but the offense looked stagnant at times, the defense also continued to plummet and Jokic stopped getting the ball when the game was on the line. Now, with a three-game losing streak the Nuggets have gone 1-3 on their four-game road trip. 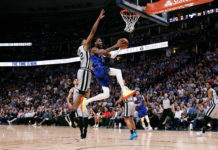 They now head back to the Pepsi Center against the Miami Heat and Sacramento Kings for two games before getting ready for the All-Star break. 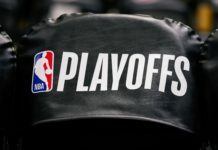 Denver is currently three games behind the Golden State Warriors in the Western Conference standings and are only ahead of the Oklahoma City Thunder by a game and a half. The Nuggets will have to get back to being a defensive-minded team that puts it all together four quarters. The All-Star Game and break could not come soon enough.